Today is much of the peaceful same. Cookies before breakfast, incense, tea; blah, blah. The past two days I've enjoyed an old favorite: fragrant Assam tea with a splash of almond milk. Of course, my former boss and friend recommended Teavana's white Ayurvedic chai mixed with my favorite black tea and he really shouldn't have done that! I'm not much of a mall-shopper, but there's a Teavana shop in the Galleria that's pretty fun to visit. Plus, we all know I'm the "Tea Lady." Now I can't stop thinking about Teavana. "Call it a diary--it is less imposing than a journal, which sounds like an end in itself. 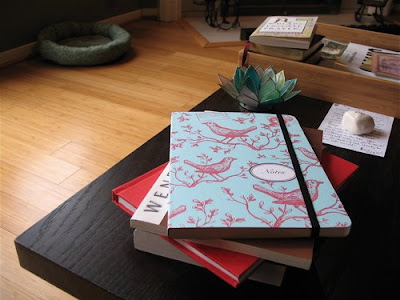 I steer clear of the word journal--and its spawn, the verb to journal, as in, 'I have been journaling all my life.' If I were to call my notebook a journal I would probably write with the notion that it be published someday, preferably posthumously, and people would marvel. This would make me self-conscious. I would be trying to perfect each sentence before its time. I prefer notes; if I clean it up too fast I lose the spark. Everything goes in: grocery lists, things to do (so I can scratch them off) random observations, knitting patterns, recipes, overheard dialogue, everything. A diary isn't sacred. Think of it as the written equivalent to singing in the shower. I don't care what I'm writing and I don't pay attention to language. A friend wanted to know what I was working on; she was reading the paper and I was writing in my diary. We were having coffee at Bread Alone. Today's really a good day for me - thank You, Jesus - but we do have to stop by the doctor this afternoon for a lil' blood test. Nothing major (or exciting), but it should reveal helpful information. Thankfully, their office is very close by, as is Katy Budget Books. I believe people of any age deserve a treat after a doctor's visit, so we'll see what the $5.00 bill in my purse can buy. Hopefully, another book in Wendell Berry's Port William series. * From what I hear, I'll want to keep going and going after Nathan Coulter. Either that or another copy of Peace Like a River. One of our pregnant friends is on limited mobility and goes through books like water. Who wouldn't want to read Peace Like a River?? I offered to lend her mine, but then I decided to write about L. Enger's book for The Curator (after the article due this week). Thus, I need another copy. It's time to check up on Jeremiah, Davy, Reuben, and Swede once again. Besides, our friend needs to own that book - it is simply that good. I think everyone needs a copy of that book. Love the new journal. My baby sling is in those same colors, but no birds, just flowers. I love the Land family! I have gone on and on about that book to anyone who will listen. So good. I hope your blood test reveals what you guys want, only good things and no steps backwards! I love that new journal of yours. How pretty. We hope and pray that you are happy. My dad is Darrell, in case Johnny doesn't remember me. I noticed Amazing Grace by K. Norris on your shelf...it's one of my favorite books. Also, Mockingbird jumped out...I have it, but haven't read it yet. 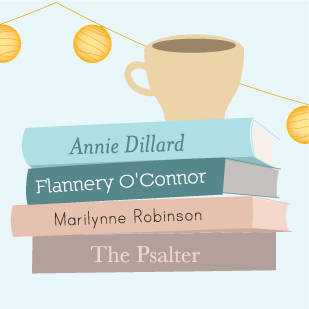 Peace Like a River keeps getting recommended to me...Enjoying your blog. Glad to have found you. Blessing and peace to you today. B.
mmm I want to drink more tea now! ... p.s. I love, love Wendell Berry. Rachel, I think Johnny got in touch with you on facebook? B, I haven't read Mockingbird yet, either, but I can't wait. I heard the author speak in Austin. Blessings to you, too. This post cracked me up...especially the "blah, blah, blah" part. There are days I feel that way about the daily routines. I have heard such great things about Peace Like a River and think I need to move it toward the top of my "to read" list. Opening a new notebook is one notch above putting on a brand new pair of shoes. Delicious.